Curiosity continues to gather information on Mars. A dust storm on Mars which began three weeks ago has grown to encompass the entire planet. It is comparable in scale to the storm observed by Viking I in 1977, while somewhat more patchy and diffuse than those observed by Mariner 9 in 1971-72 and by Mars Global Surveyor and the Hubble Space Telescope in 2001. What is unique, however, about this storm is that for the first time, researchers have a view of a Martian planet-encircling dust storm both from orbit and from the ground. There is currently a constellation of six satellites orbiting Mars and analyzing the storm—ExoMars, MAVEN, Mangalyaan, Mars Reconnaissance Orbiter, Mars Express and Mars Odyssey. The Curiosity rover is viewing the storm from the ground while the Opportunity rover, which is solar powered, is currently offline since the dust is blocking the sunlight needed to recharge its batteries. Every one of these robotic explorers is engaged in studying this phenomenon and their combined data will provide the most comprehensive data on Martian weather and climate to date. The storm was first detected by NASA’s Mars Reconnaissance Orbiter as it was approaching Endeavour crater, the site being analyzed by the nearly 15-year-old Opportunity rover. The rover’s team was immediately notified, in the case the storm grew enough to block out sunlight needed to power the rover. The contingency plans proved necessary, as by June 6, power levels on the rover dropped low enough to force it to hibernate. This is not the first time Opportunity has been force to suspend operations by Martian weather. In 2007, a previous Martian global dust storm also blocked out enough sunlight to force the rover to go into its emergency power mode. Afterwards, Opportunity and its then still active twin rover Spirit, recovered once the storm subsided. While the current storm is still less powerful than its predecessor, there still a risk that the rover’s small nuclear-powered heaters will not be enough to keep the main batteries warm enough to resume its explorations, a risk that grows every day the storm continues. Curiosity, which arrived on Mars in 2012, is still fully operational. This rover is too large to be powered by even the most advanced solar panels, and so has a nuclear generator powered by five kilograms of plutonium to provide electrical power. This power source lets the rover continue normal operations, which now include beaming data back to Earth on conditions from the ground as the storm has intensified. Curiosity is one of the amazing assets of the 21st century. We are learning so much as a result. Monday, June 25, 2018. You can't talk immigration without acknowledging the wars, Moqtada al-Sadr and Hayder al-Abadi announce an alliance, US troops are threatened publicly, and much more. In the US, will we have a serious debate on immigration? Or will it just be more Hillary Clinton funded protests that misrepresent what's taking place? Why do people immigrate? The supposed supporters of the immigrants who have just sprung up in the last two weeks don't seem to know and just seem to have a "Yeah, let everyone come to the party" attitude. That's not really going to convince a lot of people. Maybe knowledge of what's taking place would? Khalil Bendib: In the summer of 2015, a wave of refugees, taking perilous sea and land crossings to get into Europe, revealed one of the worst humanitarian crises in modern history. The wars in Syria and Iraq -- and the worsening situation in Afghanistan -- having forced hundreds of thousands of people to leave their homes and risk their lives to seek sanctuary elsewhere. According to the most recent reports, in 2014, 14 million people were displaced by war -- the most in a single year since WWII. In the past decade, 40,000 people died trying to cross international borders. The dramatic increase in the influx of refugees to Europe has produced a rise in anti-refugee sentiment, the enactment of anti-refugee laws and the construction of walls and fences exacerbating the plight of millions of people who were forced to flee violence and poverty. That's from last week's VOICES OF THE MIDDLE EAST AND NORTH AFRICA (KPFA, here for the June 20, 2018 archive). Reece Jones: Yeah and that's very evident at the US - Mexican border which I think is often emblematic of the changes that are happening at a series of borders all around the world. The data that you just mentioned is quite clear on these changes that have happened at the border. At the US - Mexican border, the border patrol in 1990 had a budget of about 300 million dollars and had about 300 agents. Today? Their budget is 300.5 billion dollars and they have over 21,000 agents. So there's been this dramatic increase in the number of agents there. Reece Jones is the author most recently of VIOLENT BORDERS: REFUGEES AND THE RIGHT TO MOVE. The borders are militarized. The people are trying to escape poverty -- on the US - Mexico border -- and war elsewhere. If the new borders effect elephants, Reece observed, that seems to arouse more public sympathy than if people are killed trying to cross borders. Is this what Sara Firth calls a "what's the point moment"? Having a real what’s the point moment today thinking about Sara’s story. A beautiful young displaced girl in Iraq dies because her family can’t afford the cancer treatment. I literally get more traction when I shoot an iPhone video of someone yelling. The selectivity with which we, as a people, show compassion is worthy of a discussion that won't take place because we're all so good and wonderful and would never, ever ignore suffering of children, right? Keep kidding yourself. In Iraq today, confusion continues over an attack two Sundays ago. Was it the US that attacked Shi'ite forces? The US whispered to CNN that it was Israel. Now that whisper is being rejected. For those who don't believe this is major -- and judging by the lack of US media coverage, a lot do not feel it is important, please note this. 2 weeks ago #US air jets targeted a group of Hashd Al-Shaabi Militants on the border of #Iraq-#Syria near #Anbar. 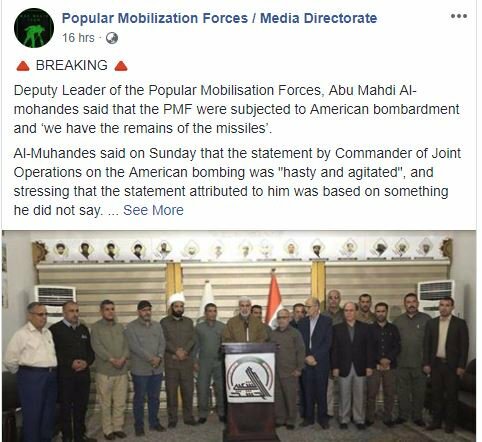 Yesterday Head of Hashd Al-Shaabi Militia Al-Muhandis stated that the Militia will not stay silent and will target the Americans for targeting the #PMF. They will target the Americans for targeting the PMF. And this is the group, please remember, that came in second in the May 12th elections. It was my absolute pleasure to meet and recognize deployed Soldiers in Iraq, Kuwait, and Afghanistan during my @CENTCOM visit this week. Your talents are not unnoticed and I appreciate all that you do for our @USArmy and our Nation. And how are you going to ensure that those US troops in Iraq are not attacked by the militias? Remember, the League of Righteousness is part of the PMF. It was Barack Obama who made a deal with the League. Are we still trying to ignore that? The League killed US troops before. Not in battle, to be clear. And Barack made a deal to let their leaders out so that the League would turn over 1 living person and four corpses (all British citizens). Didn't think of attacking the League to rescue the 1 living person, just wanted to make a deal. The League is among those now vowing US troops will die. Time to pay attention yet? The militias came in second in the May 12th elections. 163 seats are needed to form the ruling coalition. Moqtada teaming with Hadi al-Ameri brought their combined total to 111 seats. If Hayder's joining that alliance, he brings with him 42 seats. That's 153 total. They would require only ten more if they are all three teaming. If the KDP or Ayad Allawi joins them -- both have sided with Moqtada before including during the 2011 effort to toss Nouri al-Maliki out as prime minister -- that's the coalition.